The formats of the ICMPv6 Router Advertisement and Router Solicitation messages are fairly similar to their counterparts in ICMPv4. The main differences are in the parameters that are communicated. Since routers are responsible for a few more functions in IPv6 than they are in IPv4, the Router Advertisement message in ICMPv6 has a few more fields than the older version. 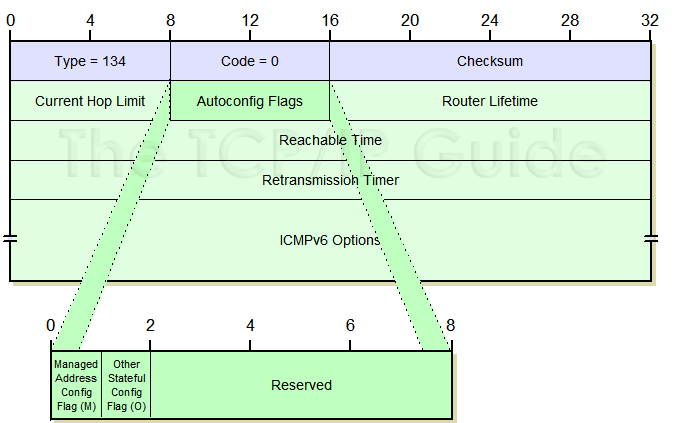 The format of an ICMPv6 Router Advertisement message is described in Table 109 and shown in Figure 158. Type: Identifies the ICMPv6 message type; for Router Advertisement messages the value is 134. Current Hop Limit: This is a default value the router is telling hosts on the local network they should put in the Hop Limit field of datagrams they send. If 0, the router is not recommending a Hop Limit value in this Router Advertisement. Router Lifetime: Tells the host receiving this message how long, in seconds, this router should be used as a default router. 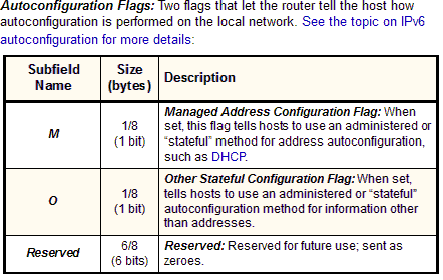 If 0, tells the host this router should not be used as a default router. Note that this is an expiration interval only for the status of the router as a default, not for other information in the Router Advertisement message. Reachable Time: Tells hosts how long, in milliseconds, they should consider a neighbor to be reachable after they have received reachability confirmation. See the Neighbor Discovery topic discussing neighbor unreachability detection for more. Retransmission Timer: The amount of time, in milliseconds, that a host should wait before retransmitting Neighbor Solicitation messages. [ Source Link-Layer Address: Included when the router sending the Advertisement knows its link-layer (layer two) address. [ MTU: Used to tell local hosts the MTU of the local network when this information may not be known by hosts on the network. [ Prefix Information: Tells local hosts what prefix or prefixes to use for the local network. (Recall that the prefix indicates which bits of an IPv6 address are the network identifier compared to the host identifier; it is thus analogous to an IPv4 subnet mask).